The last time I was on open water, I was super pregnant with my first child. My husband and I were guests of friends who own a cottage on Lake Michigan and he talked me into riding on the Sea-Do with him. I told him I would, but that he couldn’t go beyond where I could touch bottom if I fell off. Also, that, if I fell off, I’d never ever ever forgive him. Ever. Never. Not at all. I believe it’s the only promise he hasn’t kept. We rode out to open water. I may or may not have screamed so that they heard me in Wisconsin. Now, don’t worry. He didn’t go crazy fast, much as he wanted to. And we didn’t go super far out (I could have made it back to shore…I’d been swimming with that big ole belly all summer). I was in no danger. Still, I screamed. Not completely because I was scared. More because it was thrilling to be out. I didn’t tell my husband then (but he’ll find out tonight when he reads this) that it was a wee little bit fun to be on the water like that. That Sea-Do was meant to be ridden on the waves, away from the shore. I spend a bit of time each week, contemplating my writing life. Let me tell you something, there are days when it is appealing to just stop writing. Call what I’ve done “good enough” and move on to a safer, more predictable job. One with an hourly wage or a regular paycheck (contrary to popular believe, authors don’t make a terribly large amount of money). Something with a retirement plan, the potential for tenure. There is no guarantee that I’ll be able to keep finding publishers for what I write. Some days I wonder if it would just be safer to keep close to the shore. It’s secure there. Comfortable. Problem is, that’s not an option for me. Not now, at least. I was made to write. So, that’s what I have to do. As terrifying as it may be. If I stay in safety, I’m denying that I was made for more than a comfortable life. And I’m telling God that I don’t particularly trust Him. Ouch. So, out I go, into the open water of this writing life. Even if it’s just an inch at a time. I know we aren’t all writers here. But we all were made to do something that requires courage. What is that for you? Today, on the Breathe Conference blog, Deborah King writes about something similar. Go ahead and check out her post! Click HERE. Don’t give up. God has given you a gift! Thank you, Sweet Pam! I read words from another writer today that it’s a daily decision to keep going. Yes! Isn’t that beautiful? And it’s the same for anything God has called us to do. I will say, He makes it a whole lot better when I have amazing friends like you. Thank you, Robyn! I love what I do. Truly. Just some days I’m faced with how really out of the box this job is. I wouldn’t trade it for the world, though. I’m thrilled you have ventured out from the shore! Your books – away from that shore – are a remarkable gift to me – and everyone that reads them. 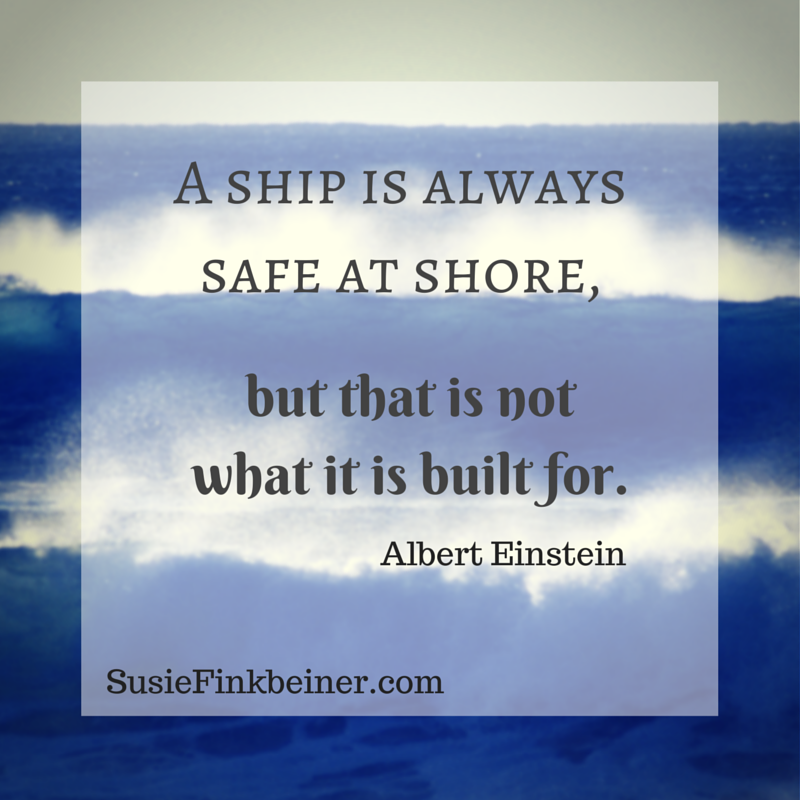 I think, in some way, we all have the “safe at shore” something. *picks up pom poms* Go, Susie, Go! Well, thank you, Beth! I truly appreciate you! I love you and I will be forever grateful that you headed out to the open water! Not only because your writing inspires so many, but the very act of your venturing encourages me so very much. Thank you for the reminder! I love YOU, Kathi! I’m so proud of you. You’ve done a lot of stepping out of your comfort zone the past few years! That’s huge! If more people thought like you do, the world would be a better place.